One of the most popular talismans spanning all cultures, religions and eras is the "evil eye". It has been said that the evil eye as protection started B.C. by the Greeks and Romans to shield ones self from bad luck and bad relationships from having too big of an ego. Through the years it has become protection from others giving you an "evil glance" from envy, jealousy and anger that curses you. What ever it means to you whether you believe its powers or not, we can all agree there is something quite special and beautiful about it. 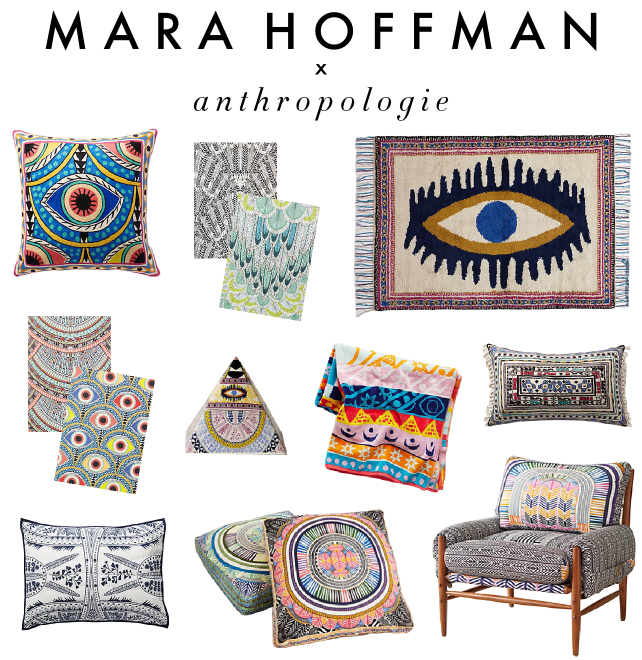 You may have read about our undying love for everything Mara Hoffman does and how we are still coveting her Eye rug even a year later but she really is the Queen of making the Evil Eye gorgeous. We also missed out on her stunning pillow but when both of us received these amazing pillows for our homes our thirst was satisfied! And I gasped out loud when I found them online at Urban Outfitters researching this post and saw that our wallets were satisfied too. Speaking of the amazing Urban Outfitters how gorgeous is this mobile? Perfect for a nursery, kitchen corner, living room, bedroom...shall we go on? This piece was actually the catalyst for this post. WE ARE OBSESSED with this Rylee and Cru onesie. A certain little bunny girl would look quite cute in it. This Chaser shirt from our faves at Ascott and Hart makes us flutter with glee and we can mini me it with the bunny. Voila! No time for a mani? Seriously...who does...right mamas? These nail wraps from Pixie Market will fix that problem for you. Your digits will be on point...literally. Cover your un-pedicured toes in these summer ready espadrilles from who else but Soludos x Jason Polan. Dying for this stunning clutch by Ourlieu. Its a perfect summertime staple to elevate any outfit. After years and years of seeing the same Eye rings over and over when we came across this Jacqui-Aiche ring we were instantly smitten. And PS...Mothers Day is a week away guys... Just saying.. ahhhemmmm...JUST SAYING this Established Jewelry bracelet is unreal. Un-real. Guys, this Established Jewelry bracelet will last you quite a few mothers days if you know what we mean.